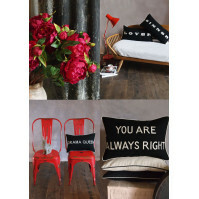 Collection of embroidered witty typography statement cushions. Perfect for the man in your life. Embroidered and piped in cream on black linen/cotton 2 ..
She's Mine embroidered and piped in cream on black linen/cotton. 2 mother of pearl buttons fa.. In your Dreams (Yes please) embroidered in cream on black linen/cotton. Two mother of pearl..
Dream On Dreamer embroidered in cream on black linen/cotton. 2 mother of pearl buttons fasten.. Always makes me smile to read this... 48 cm x 32 cm 55/45 Linen/Cotton Dry Clean ..
Baby Love, embroidered and piped in cream on bright navy linen/cotton. 55/45 linen/cotton ..
Shall we? Let's Move to New York, Embroidered and piped in cream on black linen/cotton 55..
Shall we go for Spring? Let's Move To Paris, Embroidered and piped in cream on black linen/co.. Perfect gift, these embroidered tiny cushions are a delight to any new parent. 25cm x 16cm ..